The TRMS Handheld Multimeter MTX 3283B measures securely and accurately currents and voltages. The TRMS handheld multimeter is most suitable for electricians due to its compact construction. The high bandwidth of up to 200 kHz emphasizes the characteristics of this high performance TRMS Handheld Multimeter MTX 3283B. The TRMS handheld multimeter has all common measurement functions like resistance measurement, diode test, frequency measurement etc. The TRMS Handheld Multimeter MTX 3283B is available in 3 versions. The Bluetooth version is the most practical one, since measurement values of this TRMS handheld multimeter can be transmitted wirelessly to a notebook or PC. 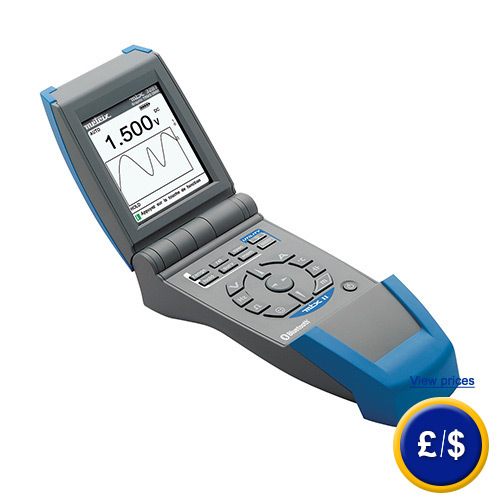 If there are any questions about this TRMS handheld multimeter have a look at the technical specification below or call: UK customers +44(0) 23 809 870 30 / US customers +1-410-387-7703. Our technicians and engineers will gladly advise you in all multimeters and all products in the field of measuring instruments, regulation and control and scales.